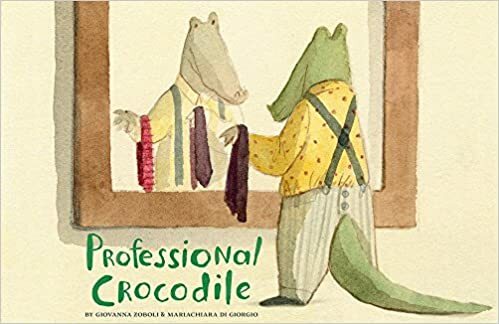 Summary: In this wordless picture book, a crocodile wakes from a happy dream of living in the jungle, then gets ready for his day. His morning routine is shown in detail, starting in his apartment where he dresses in natty business attire, then moving to his walk and train ride to get to work. He window shops and get splashed by a passing motorist. He buys a newspaper and some flowers, which he later delivers to a young lady. Finally, he arrives at work, where he makes a quick clothing change and takes his place at his job…you may be surprised to find out what it is! 32 pages; ages 4-8. Pros: I’ve mentioned before my love of wordless picture books, and this one has so much to see. There are many details on each page, including other animals mixed in with the humans. The two-page spread of the crocodile on the subway deserves at least a good five minutes’ perusal. Cons: This book doesn’t seem to be getting much promotion. I couldn’t find reviews for it anywhere. Maybe because it’s an Italian import? I have to take a guess as to his profession. Let’s see. Italian. Crocodile. Does he make shoes? Ha ha, no! I’ll give you a hint: the title tells you the answer. Looks fantastic! Thank you for writing about it. I am looking for it now.